Being a leader means working with people, and that's not always easy! Whether in your office, church, neighborhood, or elsewhere, your interpersonal relationships can make or break you as a leader. 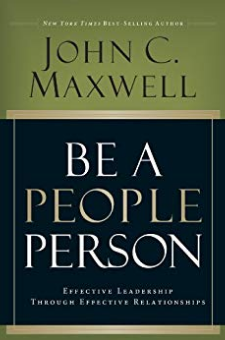 That's why it's so important to be a "people person" and develop your skills in tapping that most precious of all resources: people.In this powerful book, America's leadership expert John Maxwell helps you: discover and develop the qualities of an effective "people person" improve your relationships in every area of life understand and help difficult people overcome differences and personality traits that can cause friction inspire others to excellence and successLoaded with life-enriching, life-changing principles for relating positively and powerfully with your family, friends, colleague, and clients, Be a People Person is certain to help you bring out the best in others—and that's what effective leadership is all about.